Having spent most of his life in Hyderabad, my husband got a chance to develop a taste for a variety of dishes from the Andhra cuisine. Palak dal being among his top favorites. Whenever we visit an Andhra joint he takes a couple of helpings of this dal and by the end of the meal the other items in the thali remain intact while the dal is long gone. I tried my level best to make palak dal a couple of times but it never really matched up with the one we ate at the Andhra restaurants. One day, while I was going through Indira’s Mahanandi I found the recipe of ‘Palakura~Vellulli Pappu‘ which seemed like the same dal I had been looking for all along. Today I made this dal for our Sunday lunch and it turned out quiet well. 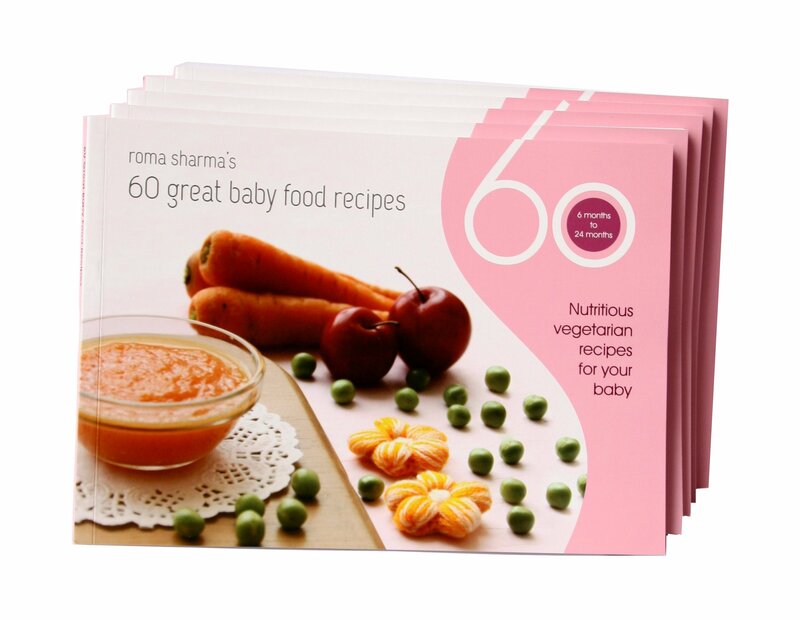 Thanks Indira for providing us with these treasured recipes. Your blog is an inspiration to all cooking enthusiasts. Mangoes have started appearing again. Well, at least the raw ones have and I cant stop myself from making the dals and chutneys that I have been missing for so long. Raw mangoes lend a sourness to the dal which is very unique. Even lime juice, tamarind or kokum can not possibly enhance the flavor of dal like kaccha aam. Soak dal for 15 mins. Wash well. Add chopped tomatoes and raw mango. Add Haldi powder, salt and water. Pressure cook till dal is completely done. Heat oil. Add rai, jeera, hing, green chillies, curry leaves and onions. Stir till onions are done. Add a pinch of red chilly powder, dhania powder and mix well. Pour a tablespoon of dal into this tempering. Let it sizzle a bit. Now pour this tempered dal into the remaining dal and give it a boil. Garnish with finely chopped coriander leaves and serve hot with plain rice. Lauki is a bland vegetable that tastes best with channa dal. 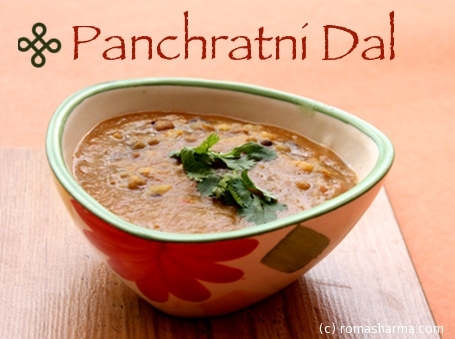 In most parts of North India this dal is made thick in consistency and eaten with rotis. This can afterwards be eaten with rice as well. So when you dont want to prepare two separate dishes this is the way to go. Soak channa dal for an hour. Pressure cook lauki cubes with tomatoes and channa dal giving it about 4 whistles. Heat oil. Add rai, jeera, haldi, hing, red chillies and onions. Fry well. Now add the dal and fry again. Squeeze in the juice of a fresh lime, garnish with coriander leaves and serve hot with roti or rice. 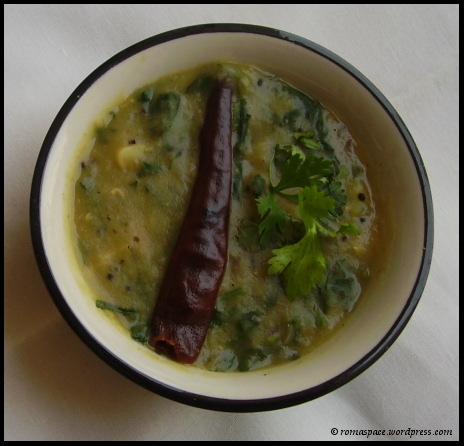 Instead of using lemon to give the tang in this dal you can try cooking the dal with kokum. 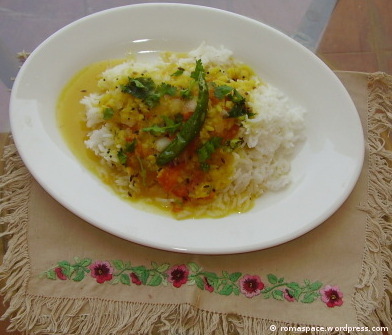 This dal serves as a welcome change to the usual dal we make at home. The green moong dal combined with the heat of ginger and pepper corns gives toor dal a twist in taste. Make a paste of black pepper corns – ginger- cloves in mortar pestle. Heat oil. Add jeera seeds, hing, onions, ginger paste, fry well. If you like more fire, add green chillies. Fry the dal in this tadka. 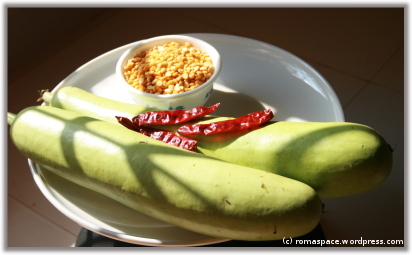 Give it a boil, garnish with coriander leaves and serve hot with rice. 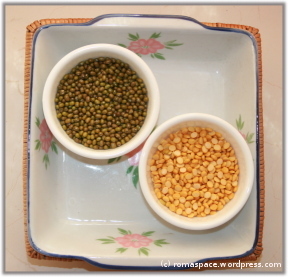 You need to give 3-4 whistles to the dal combination since green Moong dal takes longer than toor dal to cook. In this case, toor may get a bit mashed but its important that moong is done completely. Alternately, you can soak moong for a few hours and then cook the combination with fewer whistles.